STEPHANOPOULOS: Good morning and welcome to "This Week." STEPHANOPOULOS: After that ferocious second debate. OBAMA: Not true, Governor Romney. Not true. Governor, you're the last person who's going to get tough on China. ROMNEY: You'll get your chance in a moment, I'm still speaking. STEPHANOPOULOS: The race is close, combative, completely up for grabs. And now as the candidates make closing arguments, their biggest guns out in force. CLINTON: The president has your back. RICE: This is a pivotal time. STEPHANOPOULOS: Our big questions. Did Obama's comeback debate put him back in control of this race? Or can Romney knock him back down in tomorrow's face-off? What will be the final twist that determines this race? Our headliners, Chicago Mayor and former White House chief of staff, Rahm Emanuel. And top Romney ally, Senator Marco Rubio of Florida. Plus, insight and analysis from our powerhouse roundtable. 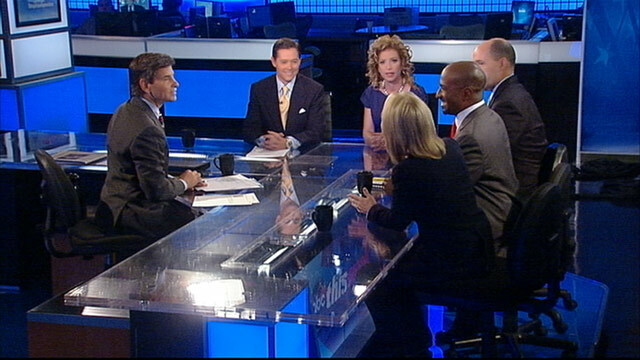 With Matthew Dowd, Ralph Reed, Van Jones, DNC Chair Debbie Wasserman Schultz and Greta Van Susteren of Fox News. And we say farewell to George McGovern. MCGOVERN: The Democratic Party will be a better party because of the reforms that we have carried out. STEPHANOPOULOS: Hello again. Early this morning, we learned that George McGovern, the first senator to oppose the Vietnam War, Democratic nominee for president in 1972, has passed away at the age of 90. We'll remember him later in the show. But we begin with the race for the White House. Just 16 days to go and more signs this morning that Mitt Romney's first debate bounce has staying power ahead of tomorrow's third and final debate. So let's get right to our headliners, Florida Senator Marco Rubio and Chicago Mayor Rahm Emanuel, who as you know, also served as chief of staff to President Obama. And Mayor, let me begin with you. You're down in Florida this morning. Polls now show Mitt Romney ahead in Florida. Even the race in Ohio now has tightened dramatically. I want to show you this RealClearPolitics electoral map. It shows that Mitt Romney has gone ahead for the first time right now. Are you worried that this race is slipping away? EMANUEL: No, I think that it's a very tight race, it's a competitive race. We always knew it was going to be in this place. In the sense that it's coming down to a few states and a few votes, and it's a clear choice between the candidates. One candidates who wants to take us back to the policies that led to the economic near-collapse of the great recession, who turned his back on the auto industry, and the president, who believes by investing in the American people, investing in the middle class, that that's the best way to grow the economy. And, George, everybody always knew this was a tight race and that it was going to come down to a few states. And I think that that's where we are today, and that's why every vote counts in these key battleground states. STEPHANOPOULOS: You talked about the choice right there. Since the second debate, Governor Romney has been out on the stump saying that President Obama has no agenda for a second term. Take a look. ROMNEY: Don't you think that it's time for him to finally put together a vision of what he would do in the next four years if he were elected? I just think the American people had expected that the president of the United States would be able to describe what he's going to do in the next four years, but he can't. STEPHANOPOULOS: He seems to be getting some traction with that argument, can you counter it? Lay out exactly what President Obama would do in a second term? EMANUEL: Sure. George, first of all, I think it's pretty clear, I make two points here. One, after a decade of war, both in Afghanistan and Iraq, the most important thing we have to do now is come -- bring American troops home and battle for America's future economically and strength in America at home. That's the most important point to be made, and that battle means doing what has done both through President Clinton to President Obama, investing in the education and training of our workforce, investing in our roads and bridges to make sure we have a 21st century economy built on the 21st century foundation, not a 20th century foundation. It moves too slow. And then third, investing in our research and development so we can stay competitive with all the new products, all the new technology, and the fundamental research. And then having certainty around our regulatory reform and making sure we have tax fairness where the middle class aren't taking the brunt of the tax system, but acting so the tax system helping them send their kids to college. The most important thing right now for a second term is to do what has worked in the past -- investing in America. And if you go to the policies -- here's the thing, there's a contrast here and we already have the facts. Mitt Romney wants to basically to do George Bush's policies, and a little more of that. Barack Obama has built policies on the same premises that President Clinton had, investing in America and strengthening America's foundation,its people and its economic bedrock, research and development. STEPHANOPOULOS: But that's what I want to get to. It sounds like you're saying that what you want is exactly more of what we had the last four years. EMANUEL: No, it's exactly -- first of all, George, when the president walked into the Oval Office, we were losing on average 800,000 jobs a month. The economy was shrinking about 8 percent. That is what was handed off from the Bush economic policies. And since that time, steady progress. An auto industry is saved. A banking system that was near-collapse, we're making now people get home loans, car loans, and student loans. And what you have now, rather than 800,000 loss, 150,000 on average created. Five million jobs in the private sector. We're also doing major research and development, both in the medical area, science and technology. But we have to keep that edge. Because other parts of the world are starting to get competitive. We also have to invest in, as he said, in the basic infrastructure of this country to move our products, both roads, airports and bridges, if it runs on rails, run rails -- runways, or roads, we have to upgrade that. And that's how you move an economy forward. And the truth is, Mitt Romney wants to follow a set of policies, George, that we have already seen the results, where the middle class lose, and for the first time in the last decade where the middle class actually lost their standard of living. That never occurred ever in American history. STEPHANOPOULOS: Let's talk about foreign policy. We can expect to see more tomorrow on the attack on our consulate in Benghazi, and in advance, some Republican members of Congress have been pressing the administration to be more forthcoming about what was known about the security situation in Benghazi. There was a letter sent Friday by the chairman of the House Oversight Committee, Darrell Issa, and one of the things he asks is, whether based on political concerns or bureaucratic neglect, the actions of this administration contributed to an inadequate and ineffective security posture in Libya as it emerged from civil war. The American people deserve nothing less than a full explanation from this administration about these events, including why the repeated warnings about a worsening security situation appear to have been ignored. And you know, that was the question the president didn't directly answer on Tuesday night. Who rejected the request for more security and why? EMANUEL: Yes, but George, first of all, I have been fortunate in my life to work on both sides of Pennsylvania Avenue, and the president of the United States has ordered an investigation of what happened, who's responsible, and bring them to justice, just like he did Osama bin Laden, Awlaki and the leadership of al Qaeda. That's what you have to do in the Oval Office. Now, I have also worked in Congress where you have an oversight responsibility. And with that oversight responsibility comes responsibility. And what Darrell Issa did by releasing names in that entire document of individuals who are working with America, put people at risk in Libya, and people around the world will now know that you're at risk if you cooperate with the United States. That office, that chairmanship of that committee comes with responsibility. And you can't act reckless with it. Now, we have a foreign policy issue. It is going to be handled. And people that did this will be brought to justice. And how it happened will be investigated so we can never see it again. But the idea that people from A, day one, have been trying to politicize this event in my view is absolutely reckless. EMANUEL: This is a time for the United States to come together, figure out what happened, which is what the commander in chief has to do, found out who did it, which is what the commander in chief has to demand, and then seek justice, which he has done repeatedly. And I would warn again, or at least highlight again, when it came to getting Osama bin Laden, Mitt Romney said that shouldn't be a priority of ours, and the president said absolutely different. STEPHANOPOULOS: Finally, Mayor, the New York Times is reporting this morning that Iran has agreed in principle to direct talks over their nuclear program. The White House has said there's no deal, though. President Obama first expressed his willingness to have direct talks when you were chief of staff in the White House. Do you believe Iran is ready now for direct talks or is this a stalling policy? EMANUEL: George, that's a good question. Let me take -- I want to take one step back. When the president walked into the Oval Office, on the issue of Iran trying to acquire and develop nuclear weapons, the United States was isolated from the rest of the world on Iran. Three and a half years later, the tables have been turned. Iran is isolated from the rest of the world. Now, that was steady, determined, dogged leadership, setting out a course. STEPHANOPOULOS: So now is the time for direct talks? EMANUEL: But -- that's not for me to say and they'll determine that. I don't have all the information. But I do know this, that three and a half years ago, we as a country, the world was criticizing us on Iran. Today, the world is criticizing Iran on its attempt to acquire nuclear weapons. That's a direct change. The tables have been turned. And the result of that is because of the steady leadership and the course the president has done in building a coalition and forcing now a set of sanctions that Europe would never have considered three and a half years ago, to a point that Iran's economy is on its knees. And I will say this, while you say we're going to turn to foreign policy -- the most important part of that foreign policy debate tomorrow will be, because I think the most important thing we can do as a country on our foreign policy is strengthen our economy here at home. It is our leadership abroad that comes from a strong economy. And the economic argument of who's going to make sure that this country is investing in itself after a decade of fighting wars overseas, I think we'll be sure to bring that peace home, and make sure that America is actually (inaudible). STEPHANOPOULOS: Mayor Emanuel, thank you very much for your time this morning. Let's go now to Florida Senator Marco Rubio. You just heard the mayor right there, Senator. What's your response to the idea that the No. 1 issue right now is bringing -- investing more in America? RUBIO: Well, that sounds like a lot of spending. I mean, obviously, we all agree that we want to grow the economy. I think the most startling thing that has happened over the last month of this campaign is the president has completely given up on outlining any sort of agenda for the future. What is his plan for the next four years? What does the next four years look like? STEPHANOPOULOS: Didn't you just hear that from Mayor Emanuel? RUBIO: He talked about spending a lot of money. But how does -- and I get that. I understand that's what he's done the last four years. They're going to continue to spend money on roads and bridges. We already did that one time, it was called the stimulus. $800 billion. And it didn't grow the economy. What about the tax code? What about regulations? What are we going to do about the onerous impact that Obamacare is having on businesses all across the country and on individuals that are on the verge of losing their coverage that they like? And the small businesses that are moving people to part-time status to avoid the impact that the health care law is going to have on them? It's just startling that the president, two weeks from election day, has completely given up on an outlining a plan for governing this country for the next four years. STEPHANOPOULOS: But you know, Senator, as I was preparing for this show yesterday, and as I was preparing, I received this e-mail in my inbox. It was from your Republican governor, Rick Scott, down in Florida, and he says Florida continues to move in the right direction, he says jobs created, unemployment down 22 months in a row. Isn't your governor making President Obama's case in Florida? RUBIO: No. Let me tell you, we have a state government here with a balanced budget, a low and stable tax code. A legislative branch that works with the governor's office and gets things done and vice versa. And so we do have progress in Florida, despite the dysfunction in Washington. Imagine if Governor Scott here in Florida, imagine if governors across the country who were doing similar things had a partner in Washington, D.C. and a president that understood how the economy grows. And that's why it's so disheartening. One of the things that's holding back our economy from growing and prospering is the lack of certainty about the future, and the president, for his unwillingness or inability to offer a governing plan for the next four years, is only making that worse. STEPHANOPOULOS: But the economy is growing in Florida, isn't it, Senator? RUBIO: It's growing in Florida because of these measures that have been taken in Tallahassee by our state government. Imagine if it had a willing partner, imagine if we had a tax code that was predictable, stable, and affordable? Imagine if the federal government said, we're going to bring these runaway regulations under control? Imagine if Obamacare was repealed? You would have real, you would have real dynamic growth on top of what's already happening in the state, not just in Florida but other states, because of what these governors and those legislators have put in place. STEPHANOPOULOS: Since the second debate, President Obama is pushing hard on the issue of trust. He says that voters shouldn't believe Governor Romney because he's shifting positions, and he came up with a word for it -- Romnesia. Take a look. OBAMA: If you say you're for equal pay for equal work but you keep refusing to say whether or not you'd sign a bill to protect equal pay for equal work, you might have Romnesia. If you say women should have access to contraceptive care but you support legislation that would let your employer deny you contraceptive care, you might have a case of Romnesia. RUBIO: That fires up his base, folks that are going to vote for him anyway. But for the rest of Americans who are trying to make up their mind who to vote for, what they're wondering is, well, that's very cute, Mr. President, but what are you going to do for the future? What is your plan to get this economy growing again? My kid is graduating college, they may ask him, and he can't find a job, what are you going to do as president? What is your plan? Where is the president's plan to save Medicare? Where is the president's plan on taxes, where is the president's plan on energy? Why isn't he talking about those things? STEPHANOPOULOS: Well, let me just follow up, though, does Governor Romney support the Lilly Ledbetter Fair Pay Act or not? RUBIO: I think that anyone who's working out there and making a living, if you're the most qualified person for the job, you should be able to get paid, you should get paid as much as your male counterpart. Everyone agrees with that principle. But just because they call a piece of legislation an equal pay bill doesn't make it so. In fact, much of this legislation is in many respects nothing but an effort to help trial lawyers collect their fees and file lawsuits, which may not contribute at all whatsoever to increasing pay equity in the workplace. STEPHANOPOULOS: One final question, and it appears you can still hear me, and that is on the issue of Iran. You saw that report in the New York Times. Does Governor Romney believe that the United States should be willing to sit down directly with Iran right now? RUBIO: I think Governor Romney had said repeatedly that armed conflict should be the absolute last measure that one takes. I am not going to comment on that story. The White House has denied it. And so there's really nothing to talk about. But I will say this, I think so much of our relationship with Iran was under this president -- was defined early in his administration when folks took to the streets there in that Green Revolution, and the president took his hands off and said he wasn't going to get engaged or involved. That unfortunately, set a tone where now Iran thinks they can go much faster and much harder than they used to think they could go, and today they are closer than they've ever been to a nuclear capability. That's very unfortunate. STEPHANOPOULOS: Senator Rubio, thanks a lot for your time this morning. I apologize again for those technical difficulties. STEPHANOPOULOS: And we'll be back with our powerhouse roundtable in just 90 seconds. STEPHANOPOULOS: And we're back with our roundtable. George Will off today, but we're joined by Matthew Dowd. Former Obama adviser, White House adviser Van Jones, also the co-founder of Rebuild the Dream. Greta Van Susteren of Fox News, welcome back. Ralph Reed, head of the Faith and Freedom Coalition, and the chair of the Democratic Party, Debbie Wasserman Schultz. Thank you all for joining us this morning. And let's start out talking about what has changed from Tuesday's debate. Matt Dowd, on Tuesday night, you gave the win to President Obama, so did your former colleague, Karl Rove. But he's arguing that it hasn't made any difference, any real difference at all in this race. Mitt Romney still has the momentum. DOWD: I think if you look at what happened before the first debate, then the first debate and then the second debate, I think Mitt Romney won overwhelmingly the first debate, according to everybody. He stopped any sort of momentum that the president had, and actually took a lead, I think, in the aftermath of that debate, and I think what the president did by showing up this time with some energy and some force, is that he actually stopped that momentum that Mitt Romney had and I think gained some enthusiasm back, which is why I think we see the race today, basically a slight advantage for the president today, a slight advantage. STEPHANOPOULOS: You would still say a slight advantage for the president? DOWD: A slight advantage, both electorally and in the popular vote. Slight, very slight advantage, but that is what I think the debate changed, it changed enthusiasm. REED: I wouldn't agree with that. I think if you look at the CNN flash poll, where they actually asked people, did it affect your vote? 25 percent said for Romney, 25 percent for Obama. No net change at all out of the second debate. But if you look at the Monmouth University poll, George, 9 percent of the voters said the first debate changed their mind. That 9 percent broke 77 percent for Romney, only 18 percent for Obama. It was the biggest swing in an election in the modern era coming out of a first debate, and Obama didn't really change that. STEPHANOPOULOS: And Chairwoman, even the new NBC poll out this morning shows a tie. They had President Obama in the lead before. SCHULTZ: So momentum is measured by actual turnout, which in many states, early voting, like Ohio, Iowa, and absentee balloting across the country, including my home state of Florida, the proof is in the actual ballots cast. And if you look at the battleground states that are the most key, we're well ahead, the Obama campaign, the president is well ahead in terms of turnout, and from our Democratic voters from where we were in 2008 in Ohio and Iowa. And in Florida, specifically, Republicans generally far outpace us in terms of absentee ballot requests. We have actually closed the gap by 85 percent in terms of absentee ballot requests in Florida. STEPHANOPOULOS: ...well ahead on election year for that to happen. SCHULTZ: ... and well and early voting too. And we will be. STEPHANOPOULOS: One of the things that was clear, Greta, I think on Tuesday night is how little respect these men have for each other. VAN SUSTEREN: Boy it was like two gladiators. And we were all sitting there watching to see if there was going to be any blood on the floor and see who would kill which - you know, who would kill who. I actually - a lot of men liked the debate. They like fighting, like the punching. A lot of women didn't like it. I don't think we learned anything particularly new. There was no ground broken. All we saw were two men who hated each other going at each other. And actually I thought it was sort of disappointing for the American people. JONES: Well, it was definitely hot and heated. A couple of things, obviously the first debate did more for Romney than the second debate did for Obama. But Obama had two jobs to do and he did them both. He had to stop the momentum. If he had gone out there and had the same performance he would be down. He is not. He was able to stop the momentum now we're back tied. But the other thing he had to do, which he did do was to get the base back exchanged. People were proud to see him stand up and to fact-check Mitt -- President Obama put a lot of fact-checkers out of work that night, because he fact-checking in real-time. STEPHANOPOULOS: Matt, I think there's no question that President Obama got the Democrats engaged again on Tuesday night, but one of the most surprising things I think I've seen over the last couple of weeks is the flip and the surge among some women voters, particularly those who had been undecided before to Mitt Romney? DOWD: Well, I think that's the main - I mean, two-thirds of all swing voters in this country today are women, 54 percent of the people who are going to vote are women. There are going to be more than 10 million more women voters than male voters when they -- by the time election day. VAN SUSTEREN: As they should. As they should. DOWD: But I think the interesting thing about this is the pattern of this race is so familiar to 2004, which I am very familiar with. STEPHANOPOULOS: It worked for George W. Bush. DOWD: In which President Bush had a five or six-point lead before that first debate. When that debate was over, it was a one point lead, or it was roughly tied. He then proceeded to get back in the game. In the following two debates he didn't win them, but he got back in the game. And as of today, eight years ago the was 48-48 in 2004, where it was two weeks out. This race is all about the base in my view and the enthusiasm of the support. STEPHANOPOULOS: Is that comforting news to you? SCHULTZ: Well, I mean, if you look at the state like Florida, the incumbent President has won every election since 1984 when they've won Florida. So the bottom line with women, though, specifically is women are going to make decisions on job creation, based on the economic decisions they make for their families like investments in education, on making sure that we continue to focus on rebuilding our economy from the middle class out, on making sure that when it comes to women's health we have a president who has our back. And the contrast between these two choices couldn't be more clear and Mitt Romney would take us backwards and women don't want that. REED: I worked on that '04 campaign, too. And I can tell you that when we went into those final two weeks, you didn't have 46 million people in poverty, two-thirds of them women and children. 3.5 million more women in poverty today than the day he took the oath of office. 600,000 more women out of work than the day he took office, a total of 9.7 million women either out of work or given up looking, or working part-time because they can't find full-time work. 70 percent of them, George, say they're going to vote on pocketbook issues like the economy, jobs and the deficit. That's not a good issue mix for Obama going into the final 16 days. JONES: The good thing, though, about women voters is that they're pretty deliberative. And they know what the economy looked like before the 2000 election, which you talk about, the 2004 election. We got an economy passed off. And the economy that got passed off was in horrible shape. I think women are fair. And they know when you get that kind of a mess and you've got to clean it up. STEPHANOPOULOS: We've got to take a break, you get the last word here. VAN SUSTEREN: I think women may think time's up. You know there are four years. I mean, you know, it's a very disappointing -- whether that's fair or not, you know that he said four years, and you can't keep saying it was so horrible. VAN SUSTEREN: Well, no, but I think that's the problem, though. REED: Three years to turn it around. STEPHANOPOULOS: Let her answer it. And then we've got to take a break. VAN SUSTEREN: Can I tell you, you know what, no -- binders and things, I mean, that is - you know I know that the Democratic Party is running with that, but I think it's - well, you know what, women have heard so much worse. I mean, women have heard so much worse about binders of women. But that was just so - I mean, it's insulting to women. Women care about jobs. They care about economics. JONES: I think women like straight talk. REED: Can I just do a quick reality check? VAN SUSTEREN: I'm with you on that equal pay. It's that binders comment. The binders comment was silly. STEPHANOPOULOS: No plans, but he still won't say whether he is going to sign it. We do have to take a break. One more guys. We have a lot more roundtable to come. We're going to dive deep into the electoral map and look ahead to that last debate. UNIDENTIFIED MALE: Mr. President this is one for you, don't mention killing Osama bin Laden anymore. It was great and all, but Americans have a short attention span. At this point saying you killed bin Laden is like saying you won the second season of American Idol. Mitt Romney do mention that you saved the Olympics, but don't mention that it was the winter Olympics. The summer Olympics are a grand spectacle of sport, the winter Olympics is just 48 different kinds of sliding. ROMNEY: President Obama and I are each very lucky to have someone who's a comforting presence without whom we wouldn't be able to go through the day. I have my beautiful wife Ann, he has Bill Clinton. OBAMA: Sometimes it feels like this race has dragged on forever. But Paul Ryan assured me that we have only been running for 2:50-something minutes. ROMNEY: It's nice to finally relax and to wear what Ann and I wear around the house. OBAMA: I feel really well rested after the nice long nap I had in the first debate. STEPHANOPOULOS: A little comic relief from the Tuesday-night tension. We are back here with our roundtable. Of course, the other big debate coming up tomorrow night, foreign policy is the focus. And I would expect that tomorrow night, we're going to see a little less ferocity than we saw on Tuesday. And in part the men, they're going to be sitting at a table, the subject matter doesn't lend itself to it. But there could be another flash point on the issue of Benghazi. It did create a moment between Governor Romney and the president the other night. Let's take a look. ROMNEY: You said in the Rose Garden the day after the attack, it was an act of terror, it was not a spontaneous demonstration. Is that what you're saying? ROMNEY: I want to make sure we get that for the record, because it took the president 14 days before he called the attack in Benghazi a terror of act. STEPHANOPOULOS: Greta Van Susteren, Candy Crowley stepping in there help the president. VAN SUSTEREN: Well, actually I think she helped Governor Romney. Candy Crowley, by the way, is an old friend of mine, I used to work at CNN. But I actually think she helped Governor Romney, because is there about 15 or 16 topics they discussed that night, and the most important issue for Governor Romney's campaign is to put the spotlight on Libya and how the president's administration has been very clumsy at best, not giving us the information, meaning the American people, what happened. So what happened is because Candy Crowley was clumsy in how she handled it, the entire discussion and even right now is about Libya where we would have probably reserved it for the debate tomorrow night. But Candy, in an unusual, bizarre way put the total spotlight -- that's all the media talked about. STEPHANOPOULOS: Do you agree with that? DOWD: No. Absolutely not. I mean, I think that Benghazi discussion, Libya discussion was the president's best moment of the debate and I think Mitt Romney's worst moment in that debate. And I have to say so many times in this discourse that we have - and Candy - what Candy Crowley did I actually thought was laudable. Because what happens in this whole thing is the truth becomes a casualty. And nobody is supposed to say what actually - what actually happened, we're just supposed to make accusations back and forth to each other and nobody's supposed to correct and say, by the way, that's not true. I actually thought what Candy Crowley did, and I hope we get to do more of that in this discourse. But I think in the course of this, Mitt Romney does not want to be talking about Libya. Mitt Romney wants to be talking about the economy. And if you take a look at all of the polls on Libya and foreign policy, and going into this debate, the president has an advantage on that, a bigger advantage than on the economy. STEPHANOPOULOS: Governor Romney's campaign doesn't seem to agree with that. They keep pushing this. STEPHANOPOULOS: Even though it's a foreign policy debate? REED: Yes. And the reason why is because we know from Ronald Reagan winning the Cold War without firing a shot, with partners like Pope John Paul II and Margaret Thatcher and Cole (ph) and others that what made that possible was a strong U.S. economy, the creation of 23 million jobs, the the creation of $16 trillion in assets in the private sector is what enabled us to fund the defense buildup and put the Soviets on their back heels. So there's no way to project U.S. power, diplomatically, economically, or militarily without strengthening this economy. STEPHANOPOULOS: But is this issue in Benghazi a winning issue for Governor Romney? REED: I think it is. And I think the reason why, George, is I certainly agree with Matthew it's not going to decide the election. But I'll tell you why this is so important, because if you look at the keys that decide incumbent elections, you got GDP growth flat, you've got high unemployment, you've got low consumer confidence. One of the things that trips an incumbent's defeat is a foreign policy crisis or a war. And this is rapidly getting to that level. SCHULTZ: Well, where I would agree with Ralph is that the Republicans certainly are trying to make it appear that there's some kind of foreign policy crisis with a drum beat towards war. And one thing that is also clear is that what Mitt Romney has doing is continuing his Dukes of Hazzard tour around the world in terms of foreign policy. STEPHANOPOULOS: But let me press you on one issue there, because what the president didn't answer on Tuesday night was, why the security - the request for additional security was rejected. And in some ways Mitt Romney let him off the hook by jumping in. VAN SUSTEREN: But that's the lesson from it -- it's what -- how he's handled it afterwards. SCHULTZ: Hold on, just let me finish - that exposed the Libyan nationals that we're working with to try to get the bottom of how this happened. Jason Chaffetz, who has been a lead surrogate for Romney, he co-signed that letter. I mean, the Republicans are just relishing the opportunity to politicize an attack on the United States that we know that the president deemed a terror attack the next day and that we need to be focusing on pulling together to prevent it from happening again. VAN SUSTEREN: Not at all. Not at all. VAN SUSTEREN: Why did they tell us -- the president could easily take the - the president could easily address the nation and sort this all out. The president has the information. And the president hasn't done this. And so all of these sort of narratives that grow up is because they're not telling, they're not -- the president should speak out. JONES: Look, over the weekend, it came out that Susan Rice was actually on - using information that was given to her by intelligence. This idea that they're shifting around - this was a fluid situation. But let me tell you why the Republicans keep attacking on this, President Obama is a towering figure on foreign policy. He -- you got somebody with a Nobel Peace Prize and he killed bin Laden. STEPHANOPOULOS: I'm not sure he wanted that Nobel Peace Prize. JONES: But think about what it means to have -- to be a towering figure. His policy on Iran, look at his policy there. There are three ways to go after Iran. Number one, you can have the week strategy, go on your own. Number two, you can have the reckless strategy: try to be a saber rattler on your own. Or number three, you can get the whole world on your side. Romney has doubled-down on weak and reckless - hold on, let me finish. Romney has double-downed on weak and reckless. Obama has pulled the world together. He is a towering figure. So what they're doing is they're taking the death of an American hero. I knew Ambassador Stevens, okay, and he's a hero to a lot of people. His approach brought out the best in the Libyan people even when he died, because he was committed to cooperation and to engagement. When he died, the Libyan people came out. JONES: Let me finish. We got -- the Libyan people came out and brought out the best in them. And they said that this was wrong and this is bringing out the worst, though, in the other party. DOWD: George, here this is what I think is what's wrong I think in this system that we have today in which there is no pause button. And there's no time for thoughtfulness on both sides of it. Somebody says something, and we automatically throw everything at them and say, oh, I can't believe they said this. They're horrible. They have bad intentions, they're evil, or what they did. Why don't we have answers and all, that there's no point in time where we can sit back and say calmly, on both sides of the aisle, it happens on both sides. But I think, let me just say one thing to put this Benghazi thing in context of like, why don't we have answers and where are they -- I worked for President Bush. We had a president and an administration for years made an argument about weapons of mass destruction for years, and now we've lost thousands of lives over an Iraq based on a false assumption and all of that. SUSTEREN; And the point is that our intelligence gathering is bad. REED: Iran, according to one independent estimate, is four months away from having enough enriched uranium for a nuclear weapon. And Egypt is being run by the Muslim Brotherhood. REED: Now, that is not exactly a great achievement in foreign policy. SCHULTZ: We have already been through shredding our diplomatic reputation across the globe through cowboy justice, that we had a go-it-alone strategy in the war in Iraq that was reckless. REED: We had 32 allies, Debbie, we had 32 allies. SCHULTZ: Let me finish, please. A go-it-alone strategy. REED: Go it alone with 32 countries. SCHULTZ: That said that we should go into a war in Iraq with faulty intelligence. And President Obama committed that he would bring our troops home, and did. When it comes to Mitt Romney's foreign policy, whether it's talking about his policy in Iran, if he thinks that we should go to war with Iran, then he should say so. SCHULTZ: We got to make sure that diplomacy -- the president is first the diplomat in chief. VAN SUSTEREN: That's why the discussion should be (inaudible) I think from Governor Romney's perspective, we pay money to over 144 countries around the world, billions and billions of dollars. UNIDENTIFIED MALE: Less than 1 percent of the budget. VAN SUSTEREN: And diplomacy is important. We have to buy our friends. VAN SUSTEREN: What I'm saying is that we can all talk about diplomacy and war all we want, but we still have to be able to afford it. STEPHANOPOULOS: I'm calling a halt to this right now. Before -- I want to get to one more issue, because we do --this is such a confusing political situation right now. The polls seem to be all over the place. Matthew Dowd, you were the first I think to write back in June that this is set up perhaps to have a situation where Mitt Romney wins the popular vote but loses the electoral college. We're back in 2000 all over again. DOWD: The possibility and the probability of that has risen each day and has risen each year, actually, over the course of the last five or six years. What's developed over in this country, which used to have an electoral advantage that the Republicans had. In 2000, they still had it, which is why George Bush could lose the popular vote by 500,000 votes and win the electoral college, though I know people say we'll (inaudible) really won Florida. But today, if Mitt Romney could win this race by a million votes in the national vote and lose the electoral college, because states like Ohio, and states like Virginia, and states like Nevada, and states like Colorado, have moved from where they were traditionally toward today -- I am not saying, as I have said, this isn't necessarily good for the country. But the possibility is very possible. STEPHANOPOULOS: You mentioned the battleground states right there, and the more you look at it, the more key Ohio seems to be above all else. I want to show a couple of electoral maps that kind of bear that out. Right now, the first one shows what I would call Obama's checkmate map. And it focuses on the upper Midwest states of Ohio, Wisconsin and Iowa. He wins those three upper Midwest states, even if Mitt Romney sweeps the board of all the other battleground states, you see it right there, President Obama still ekes out a four-point win, which is why you see Governor Romney spending so much time on that state of Wisconsin. If he feels he can't win Ohio -- look at what happens when you flip Wisconsin, though. You flip it around, and even if then President Obama is able to hold on to one of the battlegrounds like Nevada, Governor Romney's able to win 271-267. So when you look at it, though, Ralph Reed, Ohio becomes the path to the presidency for Mitt Romney, because he's even further behind in Wisconsin now that he is in Ohio. STEPHANOPOULOS: You see how hard it is on that map. REED: It's hard. It's arithmetically possible. It actually wasn't really for Bush in 2000. But the truth is, if you look at what's happening in Ohio, my view is that the in-state polls are kind of a lagging indicator. Today, in the Realclearpolitics average, Obama is ahead by about two in Ohio, give or take, well within the margin of error. But in the three most recent polls, it's effectively tied. My view is that even with a $5 billion campaign and $1 billion in attack ads, let me tell where we're heading in the last 16 days. We're going back to the way campaigns used to be run. It's who knocks on the most doors, who rings on the most doorbells, who gets people to the polls. JONES: Welcome to our world. REED: George, a lot of these states, not just one or two, will be decided by 3,000, 5,000, 10,000 votes. STEPHANOPOULOS: I think that's right. Congresswoman. STEPHANOPOULOS: But the polls are tightening in Ohio. JONES: Yes, the polls are tightening. And I agree with Mr. Reed on this point. And welcome to our world. The ground operation in Ohio is extraordinary. People need to take that very seriously. But the other thing is, the manufacturing jobs are beginning to grow again in America for the first time, and Ohio has benefited from that. And one of the reasons, not just auto manufacturing, but there is 125,000 clean-energy jobs. Every time they go on the attack and say the green jobs don't exist, there's 125,000 of them right there in Ohio, and Mitt Romney wants to get rid of them. So I think what you're going to see is you're going to pay a cost for having been on the wrong side of the auto bailout, on the wrong side of the clean energy manufacturing jobs that are growing. And the ground game that you're going to see there -- it will be tight. It will be even tighter than 2004. STEPHANOPOULOS: Are you prepared for a lot of recounts this time around? VAN SUSTEREN: I hope I get South Florida again this time. VAN SUSTEREN: With my luck, I'll be in home state of Wisconsin. REED: I'll tell you what I think is going to happen. That band of 28 counties that re-elected Bush in '04, heavily Catholic, heavily evangelical, they'll come out in the biggest numbers you've ever seen, even bigger than in '04. STEPHANOPOULOS: They're going to have to overturn where it is right now. Ralph Reed, thank you very much. Everybody, stick around. We want to come back in just a minute and remember George McGovern. MCGOVERN: And it's a victory for love and for reconciliation, not for -- not for fear and division. It's a victory for truth and candor rather than deception and manipulation. STEPHANOPOULOS: The night George McGovern was propelled to the Democratic nomination back in 1972, Debbie Wasserman Schultz, with a big win Massachusetts. And, of course, we all know that he got defeated so badly by Richard Nixon back in 1972. But always had a special place in the heart of Democrats. SCHULTZ: Yes, yes, so a generation of women owe him a debt of gratitude. DOWD: To me, they had a ticket with Sargent Shriver, probably the most idealist ticket that has ever run in the country, that these two men sort of had the moral voice and here's what we should do. But I think the McGovern thing is a very tough teaching moment, which is, you can lose, but still basically carry the day. Without George McGovern we would have never had Jimmy Carter and we would have never had Bill Clinton. Without Al Smith, we would have never had John F. Kennedy. And without Barry Goldwater, we would have never had Ronald Reagan. You can lose, but with a moral voice, carry on. REED: Yes, there have been two campaigns -- presidential campaigns, in the post-World War II period, that completely changed the trajectory of the two parties. And both of them suffered ignominious defeats. Goldwater carrying only seven states in 1964, but changing the direction of the Republican Party, as Matthew said, paving the way for Reagan. And, remember, in 1972, when McGovern carried only one state, his Texas campaign coordinator was a Yale Law student named Bill Clinton. So, in many ways, the legacy of both Goldwater and McGovern changed the direction of American politics. DOWD: Which is why it made his anti-war message so credible. STEPHANOPOULOS: And not only that, and also in his time after the Senate, after being defeated for the Senate in 1980, he did run for president one more time but also continued his work against world hunger for years and years and years. JONES: Yes, I think, you know, he has been vindicated. I mean, that's the one thing that you can say. VAN SUSTEREN: I don't think he needed to be vindicated. JONES: I think vindicated in terms of that humiliating defeat. I think you look at his face with that defeat, and then you go on, you serve 30 more years, you do as much good for the world when you're not in office as you ever were able to do when you're in office. And, you know, he means a lot not just to Democrats. DOWD: It's just great thing in politics to see somebody can lose, but basically in the end win because of what their message was and the moral clarity they spoke with. And he was that guy. SCHULTZ: And continue with their life and their career. JONES: National service, concern for the poor, all of those things. STEPHANOPOULOS: We all remember him well. Thank you all very much for a great "Roundtable," for those great memories of George McGovern as well. And for all of you at home, Ralph, Greta, and Van are standing by to answer your questions on Twitter: @RalphReed, @GretaWire, and @VanJones68, just use the hashtag #ThisWeek. And we'll be back with "Your Voice THIS WEEK." STEPHANOPOULOS: And now we honor our fellow Americans who serve and sacrifice. Over the past two weeks, the Pentagon released the names of six soldiers killed in Afghanistan. And I'll be right back with "Your Voice THIS WEEK." STEPHANOPOULOS: And finally, "Your Voice THIS WEEK," today's question comes from Lisa Larimer Burtis. "We're in town today, having toured the White House, just wondered what it would take to ensure all items in the gift shop were made in the USA?" That is a good question, Lisa. Last year, Jon Karl dug into this as part of the "World News: Made in America" series. And he found that virtually all of the products at the U.S. Capitol Gift Shops are made in America. The Smithsonian opened its first ever all-American-made shop last summer as well. And we took your question to the White House, they haven't gotten back to us yet. But we're going to be sure to follow up. Anyone else with a question, send it to me on Facebook and Twitter @GStephanopoulos. And that is all for us today. Thanks for sharing part of your Sunday with us. Check out "World News with David Muir" tonight. And tune in tomorrow night for "One on One," the candidates' debate, the final Romney-Obama face-off, at 9:00 Eastern/6:00 Pacific. I'll see you tomorrow on GMA.